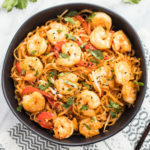 An IBS-friendly twist on the Thai classic, this low FODMAP Pad Thai with Shrimp offers a filling meal-in-one-bowl that’s packed with flavor! Heat a large skillet over medium-high heat. Add oil and shrimp; stir-fry for 3 minutes. Add noodles and bell pepper slices. Stir-fry until noodles are translucent, about 4 minutes more. Add fish sauce, sugar, vinegar, and paprika. Stir-fry until well mixed. Create a well by pushing the noodle mixture to the sides of the skillet. Add the beaten egg into the well and allow to cook until the egg just starts to set, about 1 minute. Stir the cooked egg into the rest of the noodle mixture. Add soy sauce, green onions, and bean sprouts; stir to mix. Garnish with optional sesame seeds and cilantro. Serve warm. Time Saving Tip: To speed up prep time, rice noodles can be soaked in warm water for 15 minutes. The noodles will soften but may still seem firm to touch. They will continue to cook and soften when added to the skillet.